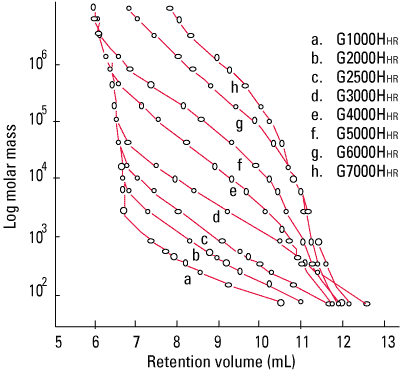 The TSKgel HHR column line consists of eight columns with different pore sizes, TSKgel G1000HHR through TSKgel G7000HHR, and five columns with an extended linear range of the calibration curve. The calibration curves are shown below. Maximum operating temperatures for TSKgel HHR columns is 140 °C for the conventional bed columns and 80 °C for the mixed bed columns. In addition, nine TSKgel HHR columns are available for high temperature and ultra-high temperature analysis, with maximum operating temperatures of 140 °C and 220 °C, respectively. Broad solvent range. All TSKgel HHR columns are shipped in THF, which can be exchanged for a wide variety of organic solvents as shown below. TSKgel HHR columns are conventional GPC columns with dimensions of 7.8 mm ID x 30 cm. Most HPLC systems do not require optimization of extra-column band broadening effects when working with conventional GPC columns. The TSKgel HHR product line contains five mixed bed columns, in which particles with different pore sizes are blended to provide an extended linear calibration curve. 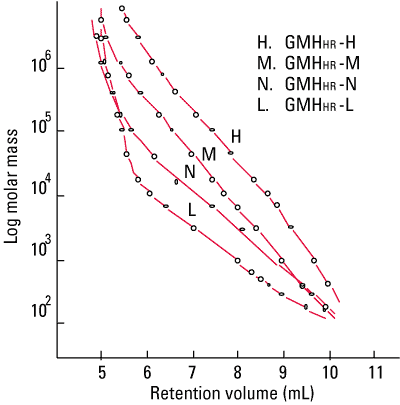 The mixd bed columns feature increasing linear calibration ranges, from TSKgel GMHHR-L, GMHHR-N, GMHHR-M, to GMHHR-H.
See table below for appropriate flow rates for solvent exchange. After switching to a very polar solvent, switching to a nonpolar is not recommended. All TSKgel HHR analytical columns are shipped containing tetrahydrofuran (THF), except high temperature (HT) columns, which contain o-dichlorobenzene.